Spring is the season of renewal and there are signs all around us. Daffodils peaking out of the sun-warmed soil, swollen buds on the Redbud trees and the disappearance of most of the ducks from the ponds. But, the official declaration of spring on the reddirt hill is the day the bluebirds begin to nest. Last year Mama II starting building her first nest on 09 March and I’ve been watching her closely. It was warm yesterday and the birds hung around the box a lot. I felt sure I’d see Mama carrying grass, but it was not to be. 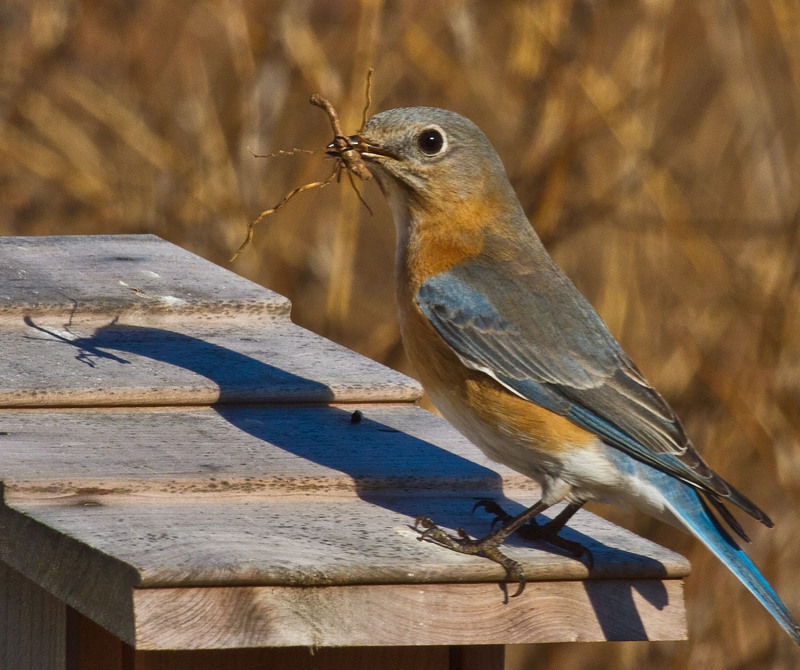 Another bluebird spring day today boosted my hopes I’d see Mama begin nesting. Today I was not disappointed. True to form, Mama began ferrying grass and taking it into the box. And true to form, Daddy supervised. He watches the box closely while Mama is inside weaving the nest, sometimes peering in the hole. Once Daddy went into the box after Mama left, to inspect her work I guess. He appeared with a big piece of grass, flew to his favorite perch and dropped it. My original Daddy did the same thing. 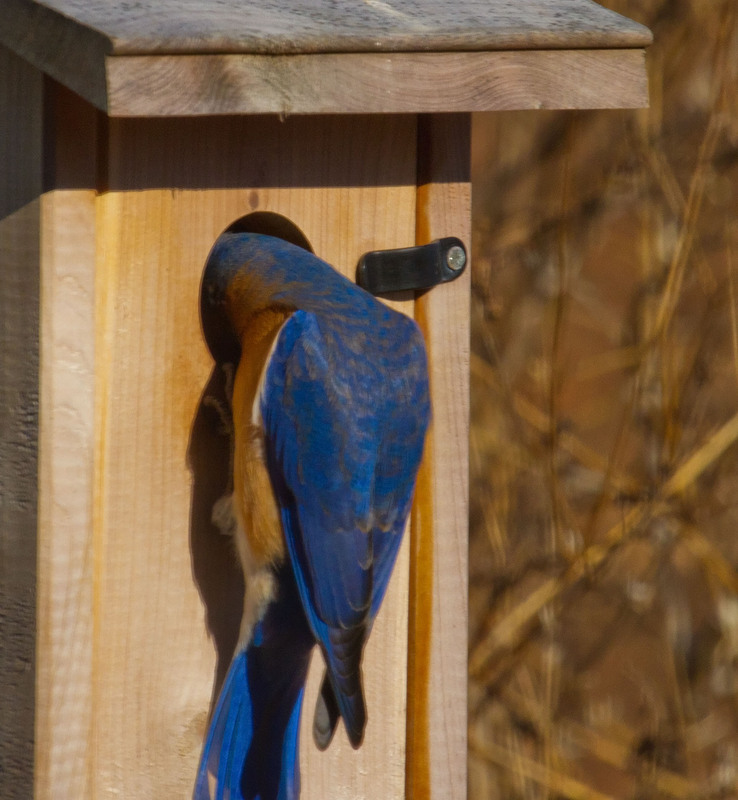 I guess the role of ‘building inspector’ is a key job element for male bluebirds. I can hear the women now– “The women do all the work while the men watch!” There. I beat you to the punch. Mama II was a fast nest builder last year. Never took her a week to complete the four she built. That means we could have our first little powder blue egg in a week. The bluebird baby season has officially begun. Stay tuned. There will be frequent entries now in the Bluebird Diary. I look forward to watching the progress of a successful breeding season. You folks deserve a wonderful spring after the winter you’ve endured. It turned out that Mama only brought in a few springs of grass. No serious nest building is taking place. I’m always fearful that the birds are nesting down on the creek or even another box somewhere. They are in and out of the yard several times daily and still checking the box. We’ll see what a string of warm days brings.